These four letters were written by Sergeant Theodore F. Ostrander (1845-1891), the son of Osmond B. Ostrander (1826-1864) and Elizabeth (“Betsy”) LeClear (1824-1913), who were inn keepers in Shippen, McKean County, Pennsylvania, in 1860. Theodore married Nettie A. Wilcox (1851-1899) in 1869. Theodore served in Company F, 58th Pennsylvania Infantry. His father, Osmond, served in Company D, 53rd Regiment. Both regiments were at the Battle of Cold Harbor in the spring of 1864 but did not serve together. Osmond was in Barlow’s Division of the Army of the Potomac. Theodore was in Brooks’ Division, Army of the James. Barlow’s Division was much more heavily involved and suffered far greater losses. It was here that Osmond lost his life in early June 1864. In the first and second letter, Theodore writes from northern Virginia, following the debacle of the Peninsula Campaign. He shares his views on the war and attributes the failures of the army to unsatisfactory leadership among its generals. In the third and fourth letters, written much later in the war, we learn that Theodore was arrested 9 days before the 28 September 1864 Battle of Chapin’s Farm — a battle that cost the lives of six officers and 128 enlisted men in his regiment alone. This places Theodore’s arrest on 19 September. After the Civil War, Theodore moved to Superior, Wisconsin, then to Wadena, Minnesota, then moving south because of his health to Tennessee. I now seat myself for the purpose of writing you a few lines in answer to your letter which I received yesterday and was very glad to hear from you after so long a time and Lottie did you find writing a remedy for melancholy? I think it would be a poor remedy for me. Oh how does Dr. Robbins prosper? Does he get plenty of business to do and does Dr. Lasher practice also? I think if she does, Dr. Robbins stands a fair chance to get a living by his profession. But enough of that and we will talk about war matters. I think as you say after those cities are taken that you mentioned, I think somebody will get their eyes open. I think that these draw backs [are] due to the fault of our generals and not the president. I do not think that we could get another man more fit for the place that Old Abe holds than he himself. But I do think we could place a general at the head of our army more fit for that office than those that now hold that situation. Perhaps we have not. If so, I think it is time to give up the ghost. But as you say, we must turn the best side out and keep up good courage. But the way the thing has turned for the last few days, it is almost impossible to do so. For my part, I think it will all turn out well. But where there is one that thinks so, there is three that is almost discouraged entirely. I suppose there is some good Union people in Norwich that laughed in their sleeve at McClellan’s repulse before Richmond. I wished some of them would get drafted. But I presume it will be their luck not to if they get drafting going on there. I do not know but McKean [County] has filled up her quota. I think I have heard that she had. I received your welcome letter this evening and as opportunity offered itself, I would try and answer it but do not know as I shall have time to do it before roll call but will write all the nonsense I can as usual. I had nearly made up my mind that you were not going to favor me with another letter but I am happily disappointed. I should think that it would be rather lonesome on Bunker this winter. It always seemed to me to be a lonesome place that I never had any desire to live but I do not know as it won’t be a more lonesome country to live in than this country would be. All that the poor class of people live on is crabs which they get in these low, marshy places when the tide goes out. I say all they have to live on. It is not for they have corn dodgers & once in a wile they have a little bacon, but not to amount to much. It is a desolate looking country — not a fence to be seen, cornfields destroyed & the corn likewise, potato patches all dug up, and other contents confiscated to the use of the soldiers. The soldiers confiscated them themselves when we went to Black Water. You have no idea of the amount of potatoes that was dug, fences all torn down to make fires with, apples knocked off of the trees — that is, all that we wanted to eat. When they is apples in this enemy’s country, I shall have all I want if I can get them — also potatoes. I do not know whether it is right or not. Whether it is or not, it is the way that the soldiers generally do in this vicinity of the country. You wanted to know what I thought of the removal of Little Mac. Well I say that McClellan has had command of our grand army long enough to see whether he could do anything or not. But it seems that after burying about one hundred thousand men, losing cannons, &c., and now stands worse than when the Rebellion broke out, I say now try another man & see what he will do. I think that by all evidence that he ought to be removed. They is one thing certain, McClellan is a smart man capable of handling a large army & he had a large one to handle but it seems to me that he did not do as well as he might have done & perhaps he done the best he could. I hope that if he did, it will all come out right yet. I hope that Burnsides will prove as successful commanding the whole army as he did a division commander. If he does, we will have no fault to find with him. I can not say as we have any fault to find with McClellan but I think that the War Department had good reasons for his removal or they would not have done it. Well, I declare Lottie, I was somewhat surprised to learn that Lydia was going to be married (or rather was married if I am not mistaken). I heard that it was yourself but it seems I heard wrong. I think Charley is a fine, steady fellow & will make a good husband as you say. I hope he may be worthy of her in every respect. I thank you for those lemons [?] & should like to had have had a piece of the wedding cake but that was not to be so I will content myself hoping that Charley may return safe & sound from the army. I heard that William Rifle has received his discharge. I thought when he enlisted that he would not be many months in the service but he was in longer than I expected. When he enlisted he said that he would not have done it but he said that the next chance he got he would join the army and the next day the opportunity offered itself and he did not want to have the boys laugh at him for backing out. I wish not to say anything against him & think I have not. Neither would I like to have him hear what I have said on the subject. I see that a great many men in the Army of the Potomac get furloughs. I have thought some I would try and get one & come home & then I think it will not pay for I have nothing to come home for — only to see my friends and I guess I will put that off a couple of years longer just as well as not. I have not got any homesick yet & think I will not for it will do no good. Might just as well stay happy & contented where I am & wish for better times to come. Tell Lydia — or rather Mr. & Mrs. Rice — I wish them much joy. They is once in awhile one of our soldiers get married to a southern lady here. I can not see what in the world can induce them to see anything nice about these she-rebels. Well, I guess I have wrote foolishness enough & will stop. Perhaps you will think I am out of paper by the way I wrote this letter. I did not expect to write so much. I should be pleased to call up on Bunker and visit your school. Perhaps if you are teaching there two years from now and I am well, I will call up and make you a visit. 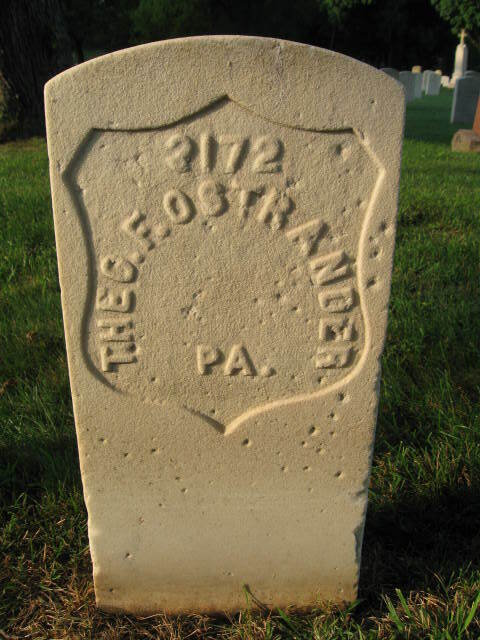 Please write soon to your friend, — T. F. Ostrander, Co. F, 58th Pa., Suffolk, Va. Your extremely welcome letter of the 25th November came to hand last evening. You little know the joy it gave me to receive the same. It pained me much to learn that you had been informed of my misfortunes although it was my intention to tell you of it when I knew the final result of the same. As to Mr. [Edward W.] Pangburn’s telling the truth, I am unable to say as I have not heard as yet what he told of me when he came home. I will now tell you all about the whole circumstances and I do not know as I have any desire of its being kept secret as I can not see as it is anything I ought to be ashamed of. To commence with, I presume you know that I did not return to the front with the regiment but came a few days after. I left Philadelphia on the 1st of September for my regiment at which time I was attacked with the disease called the neuralgia which I can say is very painful. I reached my regiment on the 14th of September and can say instead of being any better, was much worse. My face was swollen so that I could not see any out of one of my eyes and as I was in such pain I could do nothing but go to the doctor for medicine and he have me morphine several days. I was getting much better but still taking morphine and the morning previous to the evening of my arrest, I had my name placed on the sick list. But when I came to go to the doctors, I see that they was so many going I was ashamed to go. Therefore, I went back to my tent. That evening I was detailed for picket and went on. I had been on post but a short time when my face began to pain me again as usual. I had two morphine powders in my pocket which I had got from Asst. Surgeon [Pennock J.] Nichols. One was to be taken in the evening and the other in the morning, but the pain was so severe I resolved to either kill or cure and took the two powders at one dose [and] consequently got into trouble. I went on post at 2 o’clock in the morning and about half past 3 o’clock the morphine threw me into a stupor. I remained on duty that day and the next morning which was the 19th of September, was placed in arrest, and sent to the guard house of the 1st Division, 18th Army Corps to await my trial. I assure you it was not very pleasant for me to be there as my offense was no trifling one — the penalty of which was death or such other punishment as may be inflicted by the sentence of a General Court Martial. But at last the trial came. Both of the surgeons of my regiment appeared in my behalf and swore to the facts of which I have above stated. The trial was at last over. Then came one long weary month of which time I was awaiting my sentence. One morning while thinking that it was time they done something with me, the Provost Marshal came to me and informed me that I was released and returned to duty. Oh! didn’t I feel good then. I have here told you all my trouble and why I did not write you before I did. It was my desire to be at liberty before I wrote you but I began to think that it would be sometime before I would be in that position. Consequently I wrote you while awaiting the sentence of a court martial. Give my kindest regards to Mrs. Brewer. Tell her that I am still doing well and will soon have the pleasure of telling you all that Richmond will be in the possession of the Yankees. The Dutch Gap canal is nearly completed. They has been 400 barrels of powder ordered to the canal for the purpose of blowing the ends out of the same. You may expect to hear of more fighting from the Army’s of the James & Potomac soon. A part of the 18th Corps has marching orders now and I expect we will have before long. All extra baggage has been ordered to the rear today. The next fight we have we are either going to gain one of the greatest victories of the war or get one of the greatest lickings. The army is in good spirits [and] has been largely reinforced by recruits. Our regiment has got three hundred conscripts and substitutes and I assure you it makes the regiment look far different from what it did after the Battle of Chapin’s Farm. Do you intend teaching school this winter or will you take a rest? Lottie, please give my respects to all your folks. I often times think of you all and wish I could have the pleasure of seeing you all once more but I fear it will be some time ‘ere that happy event will take place. P. S. Tell Charley I am happy to learn that such a change has taken place in his mind in relation to McC & C. — T. F. O. Once more I find myself seated for the purpose of writing to you in reply to your truly welcome letter of June 18th. I have not had time to reply ‘ere this although your letter has been in my possession for some time past. The last of June & first of July are the busiest times with me during the whole year as Muster Rolls, Ordinance Returns, Clothing and Camp & Garrison Returns all have to be made out then and forwarded to their respective bureaus, and I think I had more than my share to do this time as I assisted in doing the above work for two companies besides this one. I assure you that I shall be most happy when I look upon the last paper which has to be made out and forwarded to Washington pertaining to an Officer’s responsibility at the same time. It is not my business to make any of the above papers. I have done no other business but that since I was freed from limbo last fall. How often do I think of the two months and twenty days spent in the 1st Division 24th Army Corps guard house and how anxiously I waited for my trial to take place at last that came. Then the suspense of waiting for my sentence and after a long time it came. I was ordered to report for duty to my company. Oh! didn’t I feel good! Well, I rather guess I did, but since that time I have thought it was one of the most fortunate circumstances that ever happened [to] “Shanty McGuire” for if you remember, the Battle of Chapin’s Farm was fought only nine days after I was confined. That engagement proved the most disastrous to our regiment of any it was ever engaged in. Who knows but what I might have got my figure head all smashed to a jelly by one of those 400 pounders which they threw at our forces so freely. I think I will have to admit in this one instance that all is for the best. At the same time I cannot in this [believe] that they do not muster us out of the service. I am sure I did not contract to spend my natural life toting an old musket & knapsack where there is no earthly need of it. If I can only get clear of Uncle Samuel, I would see America annihilated before I would render it any service. When the government treated me as one ought to have been treated, I would have made any sacrifice for her. But I have got the wool off my eyes and now am mad to think I made such an idiot of myself. But the past can not be recalled and let it go for what it will fetch. How did you enjoy the 4th [of July]? It was very dull here with the exception of the 188th Pennsylvania Volunteers. The man who was Major of that Regiment sent a number of kegs of lager beer and they got very happy and raised the devil generally — burnt down a preacher’s house, drove all of their officer’s out of camp. I will enclose a piece but from the Richmond Times in regard to the burning the house and will here state that a part of it served the preacher right and I wish to God he had been in the house and burnt up with it. During the 4th, I remained in camp and went to the theatre in the evening. You can hardly imagine the feelings that exist here among the soldiers in regard to their not being mustered out of service. I fear if they are not soon, that they will be a young rebellion.